I’ve been to Icis Living several times recently to check out their pop-up boutique (The Collection at Icis), which features the designs of Bagstil, 020608 Tears of Bleu, and more. 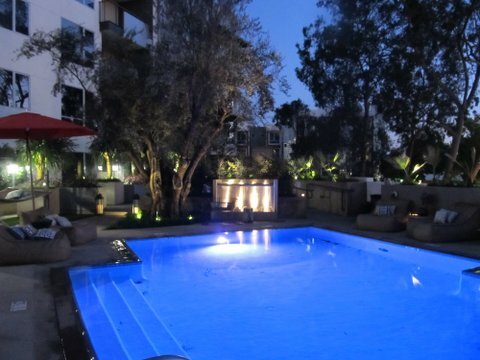 However, this time I was back for happy hour at the posh luxury apartment complex and I brought Bagstil designer Cindy Gellersen and Caius Olow (designer for 020608 Tears of Bleu) with me. The sophisticated residences that embody this high-style community were inspired by the finest design hotels in the world. The complex hosts a number of exquisite amenities including an outdoor amphitheater, a game room, a body salon, a pet friendly terrace, and much more. (Click here to see the complete listing.) If you lived here you would have very little reason to leave the area, except for the occasional visit to your favorite restaurant. Another perk of being a resident at Icis Living is the weekly complimentary happy hours that are held in the Members Only Lounge, which features a catering style kitchen with a formal dining room and a fireside retreat. Luckily, the kind folks at Icis invited the bloggers of Two Point Oh! L.A. to the event, so we got to enjoy cocktails and treats while enjoying the breathtaking view from The Resort area. Icis Living is located at 546 West Colorado St. Glendale, CA 91204. Various lounge areas can be booked for private events.